We’d love your help. Let us know what’s wrong with this preview of Debt Cleanse by Jorge P. Newbery. Like many Americans, Newbery struggled with debt. But unlike most people, he owed more than $26 million. Creditors swarmed after a natural disaster devastated his multi-million dollar business. The stress was crushing. He needed a way out — and what he discovered will amaze you. His breakthrough ca Jorge Newbery erased his debts without filing bankruptcy. Now you can, too. His breakthrough came practically by accident. One of his creditors made a sloppy legal mistake, and he battled the creditor all the way to the Missouri Court of Appeals. The court ruled that the entire debt — nearly $6 million — was "inadvertently extinguished.” It didn't have to be paid. It was completely eliminated. * Assert your rights and defend yourself against creditors. * Stop making payments — and turn that to your advantage. * End harassing collection calls. * Dispute your debts to stack the odds in your favor. * Uncover deficiencies that can put money in your pocket. * Protect your assets from creditors (100% legally). * Negotiate the best possible settlements. * Be debt-free for life. Debt Cleanse shows you how to gain leverage over your creditors. You can settle your unaffordable debts for pennies on the dollar – and not pay some at all. Don't let your debt burden you one more day. To ask other readers questions about Debt Cleanse, please sign up. "Watch out America; get ready to cleanse your debt! 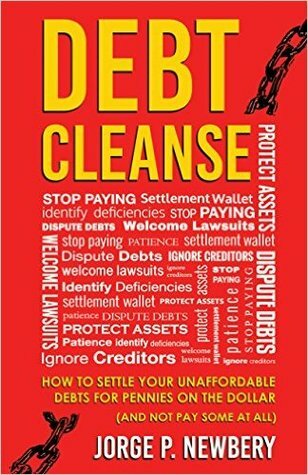 Debt Cleanse: How To Settle Your Unaffordable Debts For Pennies by Jorge P. Newbery is coming in at the right time. America is in debt from national to state and also municipal. The whole system is in a downward spiral. The bigger concern is personal debt, mortgage, student loans, credit card and car loan debts. If you are drowning in debt, like many of your fellow Americans, it is a frightening and disabling effect on you and your family. Newb "Watch out America; get ready to cleanse your debt! Debt Cleanse: How To Settle Your Unaffordable Debts For Pennies by Jorge P. Newbery is coming in at the right time. America is in debt from national to state and also municipal. The whole system is in a downward spiral. The bigger concern is personal debt, mortgage, student loans, credit card and car loan debts. If you are drowning in debt, like many of your fellow Americans, it is a frightening and disabling effect on you and your family. Newbery’s solution is Debt Cleanse. Debt Cleanse, I found out quickly, is not just another “how to get yourself out of debt” book with chapter after chapter of theory, Newbery comes right out and hands you specific step by step instructions for whatever mess you are in. The great thing is his steps are from his own playbook. Newbery is ridding himself of millions in debt with his own system, and it is working. You can read his other book, Burn Zones: Playing Life's Bad Hands to read his story of how it got there. Will it work for you? You bet it will! I myself was drowning in debt years ago. I didn’t have Debt Cleanse to show me the way. I inadvertently stumbled on the key points of his book through my own trial and error and now I am debt fee. I only wish I Debt Cleanse had been published back then! I would have saved myself a lot of gray hairs. Super informative, packed with great information that you can use to settle most of the debts weighting you down. I estimate the techniques advocated within will work for the vast majority of debtors and debts, although not 100% of the time (unfortunately, as Newbery reminds us, there is no magic bullet). The book is well-written and explained in such a way that even finance novices can understand. If you can't afford your debts, this book is well worth the price of admission. "Imagine your life without debt." Debt Cleanse is a very resourceful read that I will keep tucked away when and if needed. It's a helpful guide to allow the person in debt better piece of mind and an action plan for a richer and better life. At first I found this 400 page + book daunting but it reads smooth and easy to comprehend. This informative book is clear, precise and simple to follow. No guess work needed. I hope families will be helped by the material shared here. It's almost too good to b "Imagine your life without debt." This informative book is clear, precise and simple to follow. No guess work needed. I hope families will be helped by the material shared here. It's almost too good to be true and yet it makes perfect sense. The stress of debt causes ongoing distress and inner turmoil. This is a step by step plan and approach to alleviate a good deal of this stress. This is a well needed book that I think will improve people's lives for the better. A generous offering, in my opinion and an inspiring gift for a more rewarding life. Jorge Newbery has documented his steps as he is cleansing his debt; therefore he has given us a precise look at what it would take to be debt free. As of the writing of Debt Cleanse: How to Settle Your Unaffordable Debts for Pennies on the Dollar, he isn’t debt free, but he has taken a significant chunk out of the millions he owed. He gives a step by step plan to find the loop holes but realizes there are more depending on the state in which you live. While reading this book I had two major thoug Jorge Newbery has documented his steps as he is cleansing his debt; therefore he has given us a precise look at what it would take to be debt free. As of the writing of Debt Cleanse: How to Settle Your Unaffordable Debts for Pennies on the Dollar, he isn’t debt free, but he has taken a significant chunk out of the millions he owed. He gives a step by step plan to find the loop holes but realizes there are more depending on the state in which you live. While reading this book I had two major thoughts warring against each other. First thought was it goes against everything I have been taught about debt. Debt that I acquired should be paid. But as Jorge explains the process of debt being sold under you for a minimal of what you owe, without proper documents from the new loan holder stating they acquired the item. This brings me to my second thought; this would have been so helpful years ago when thousands of people lost their homes. Excellent book for those who feel they are drowning in debt. I received this as a first read. This book has many tools and tricks to help you end your debt. Definitly has some tricks I have never heard of. also this book is a very easy to read and to understand. It is written well and clear. A very informative book. Jorge P. Newbery is a successful entrepreneur, distressed debt and real estate investor, endurance athlete, and author. He turned around some of the country's most troubled housing complexes in amassing a portfolio of 4,000 apartments across the USA from 1992 - 2005. However, a natural disaster triggered a financial collapse in which he lost everything and emerged over $26 million in debt. He neve Jorge P. Newbery is a successful entrepreneur, distressed debt and real estate investor, endurance athlete, and author. He turned around some of the country's most troubled housing complexes in amassing a portfolio of 4,000 apartments across the USA from 1992 - 2005. However, a natural disaster triggered a financial collapse in which he lost everything and emerged over $26 million in debt. He never filed bankruptcy. Instead he developed strategies to gain leverage over creditors to settle debts at huge discounts, or simply did not pay them at all. He is a veteran of dozens of court battles, once fighting a creditor to the Missouri Court of Appeals. The entire debt (over $5,800,000!) was inadvertently extinguished due to sloppy legal work. As an athlete, Newbery raced bicycles for a living from 1986 - 1990 as a Category 1. He competed in the 1988 Olympic Trials and was 4th in the Spenco 500, a nonstop 500-mile bike race televised on ESPN. He also raced for the Costa Rican National Team in the Tour of Mexico, was 2nd in the 1987 Southern California State Championship Road Race, plus held the Green Jersey in the 1987 Vulcan Tour. Newbery also runs and has completed over 70 marathons and ultramarathons. In 2012, he was the overall winner of the Chicago Lakefront 50K. At 46-years-old, he was double the age of the 24-year-old second-place finisher. Today, Newbery helps others crushed by unaffordable debts to rebuild their lives. Jorge is Founder and CEO of American Homeowner Preservation (AHP), a socially responsible hedge fund which purchases nonperforming mortgages from banks at big discounts, then shares the discounts with families to settle their mortgages at terms many borrowers find "too good to be true." Jorge's response to the nation's mortgage crisis creates meaningful social and financial returns for investors, while keeping families in their homes. AHP's mission is to facilitate win-win-win solutions for homeowners, investors and lenders. "Burn Zones: Playing Life's Bad Hands" is Jorge's autobiographical account of how he was pushed to his physical and mental limits during his time of strife, and how he overcame the challenges he faced. "Debt Cleanse: How To Settle Your Unaffordable Debts For Pennies On The Dollar (And Not Pay Some At All)" shares Jorge's strategies and provides step-by-step instructions to get out of debt. Jorge is a regular contributor to Huffington Post and other publications, and speaks regularly on debt, investing, finance and housing issues.